For 65 years, the MSA has conducted school contests promoting salmon conservation, fun on the river, and the importance of a clean environment. 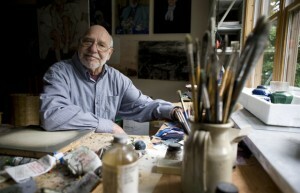 The MSA’s annual art contest has been renamed in honor of Bruno Bobak – one of Canada’s most important artists and avid salmon fisherman and supporter of the Miramichi. 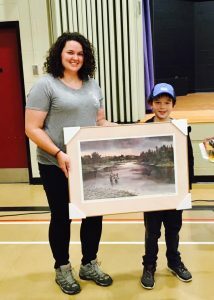 The overall art contest winner for 2018 was Gavin Wishart, a grade five student from North and South Esk Elementary School (NSEE). His submission was chosen by Bruno’s son, Alex Bobak, to receive the honour. NSEE received a framed Bruno Bobak print to display in their school.